Effective government policies are essential to increase the healthiness of food environments and to reduce obesity, NCDs, and their related inequalities. Food environments are defined as the collective physical, economic, policy and socio-cultural surroundings, opportunities and conditions that influence people’s food and beverage choices and nutritional status. Unhealthy food environments lead to unhealthy diets and excess energy intake which have consequences in levels of morbidity and mortality. It is critical that Governments implement preventive policies and actions to match the magnitude of the burden that unhealthy diets are creating. Monitoring the level of implementation of the policies and actions recommended by the World Health Organization (WHO) is an important part of ensuring progress towards better nutritional health. 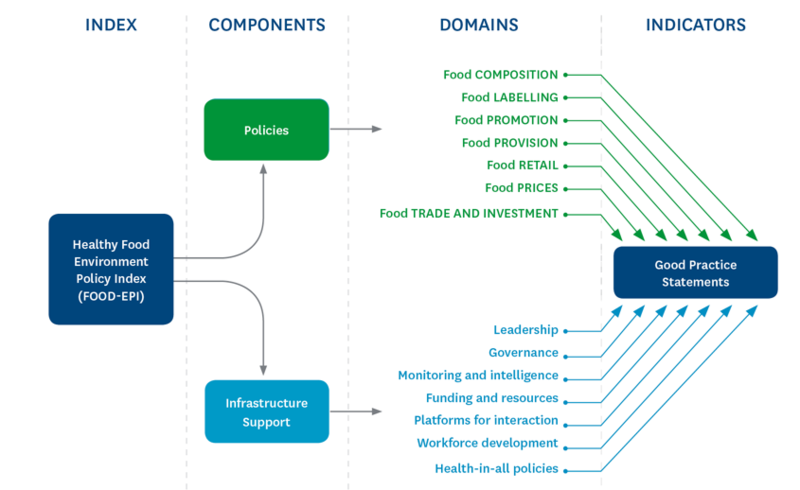 The Food-EPI index consists of two components (Policies and Infrastructure Support), 13 domains and 47 good practice indicators. A national expert panel aims to rate the level of implementation of policies on food environments by the Government against international best practice, and then, based on the implementation gaps, propose and prioritize key actions for implementation by the government. The 2017 Food-EPI was conducted from April to May 2017 by a New Zealand Expert Panel of 71 independent and government public health experts who rated the extent of implementation of policies on food environments and infrastructure support by the New Zealand Government against international best practice. Their ratings of each of the 47 good practice indicators were based on documented evidence, validated by government officials, and international best practice benchmarks. The level of implementation was categorised as ‘high’, ‘medium’, ‘low’, or ‘very little, if any’. Over two thirds of the specific food policy indicators but less than one third of the infrastructure support were rated as ‘low’ or ‘very little, if any’ implementation. Taxes on unhealthy foods and beverages and zoning laws to restrict unhealthy food outlets around schools had no evidence of implementation whereas restricting unhealthy food marketing to children and having healthy food policies in schools and early childhood centres were rated as low implementation. Four workshops around the country with the experts also identified and prioritised actions for the Government to improve food environments and contribute to a reduction in obesity and diet-related diseases. The Government is performing well, at the level of international best practice, in preventing unhealthy foods carrying health claims, providing nutrition information panels on packaged foods, transparency in policy development processes, providing access to information for the public and monitoring prevalence of chronic diseases and their risk factors and inequalities. Experts recognized progress since 2014 for implementation of the Health Star Ratings, initiating systems-based approaches with communities, developing and implementing the Healthy Food and Drink Policy in the public sector and improving platforms for interaction between Government and other sectors and across Government. There are however major implementation gaps with about 70% of the recommended policies such as healthy food in schools, fiscal policies and marketing restrictions for unhealthy foods. One third of the infrastructure support systems rated as ‘low’ or ‘very little, if any’ implementation.. The Expert Panel recommended 53 actions in total but prioritised 9 for immediate action.The Government is strongly urged to act on these recommendations to improve the diets of New Zealanders, especially for children, and to reduce the burgeoning health care costs of obesity and unhealthy diets. Including policy objectives and targets to reduce obesity prevalence and inequalities, and more and stronger policies to create healthy children’s food environments and increasing funding for the implementation and evaluation of the plan. voluntary reformulation of composition (salt, sugar and saturated fat) in key food groups. in children’s settings, including ‘school food zones’. Ensure healthy food in schools and early childhood education services. Introduce a substantial (eg 20 percent) tax on sugar-sweetened beverages. Strengthen the Health Star Rating System. Implement the new Eating and Activity Guidelines. Conduct a new national nutrition survey for children. Implement a comprehensive national action plan for obesity and NCD prevention. food composition (salt & saturated fat) in key food groups. Increase funding for population nutrition promotion, doubling it to at least $70m/year. ensuring that schools and ECE services are free of commercial promotion of unhealthy foods. Ensure that food provided in or sold by schools and ECE services meets dietary guidelines. Implement the front-of-pack Health Star Rating labelling system. Introduce an excise tax of at least 20% on sugar-sweetened beverages. The Healthy Food Environment Policy Index is currently being implemented in about 14 countries globally. Some countries have finished the process and if you click on the name of the country you will be referred to available reports and publications. 26 Independent Malaysian public health experts undertook the policy analysis with rating against international best practice. Priority recommendations were generated to close critical gaps in policy implementation. Food-EPI findings were disseminated to the new Malaysian government, as well as other South East Asian stakeholders, to strengthen national and regional food policies that would promote healthier food behaviours.